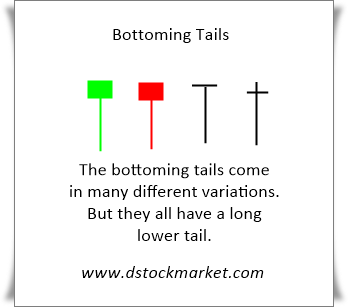 The bottoming tail is a candlestick pattern you should learn if you want to spot bottoms in stocks. When a bottoming tail appears, it often marks the end of a move and a fresh rally will soon follow after that. The longer the tail, the more powerful the reversal signal will be. The bottoming tail can come in many different variations. Some have bodies and some do not have bodies. But the message that they give is very clear, the stock has at one point gone very low but it rejected going lower and shot back up to close near the highs of the day. Bottoming tails have one thing in common. They all have very long tails. In the chart above, you can see ADBE formed a bottoming tail at its 200 MA. This is a very powerful combination because it told us that there were people who were buying the stock at the 200 MA. Watch how the bottoming tail marked the end of the downward move. 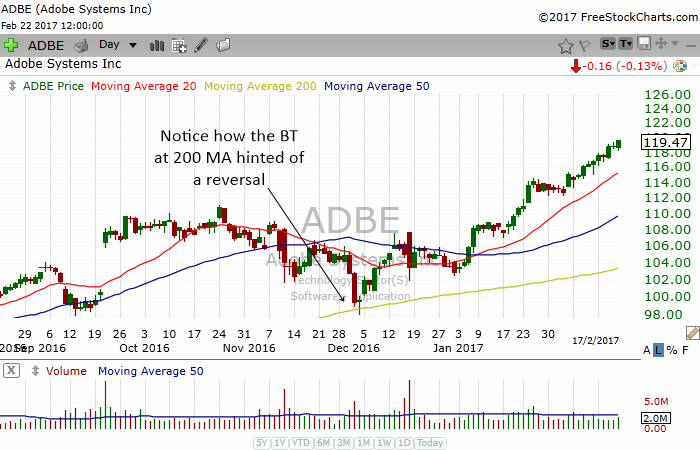 ADBE shot up higher very fast in the next few days. 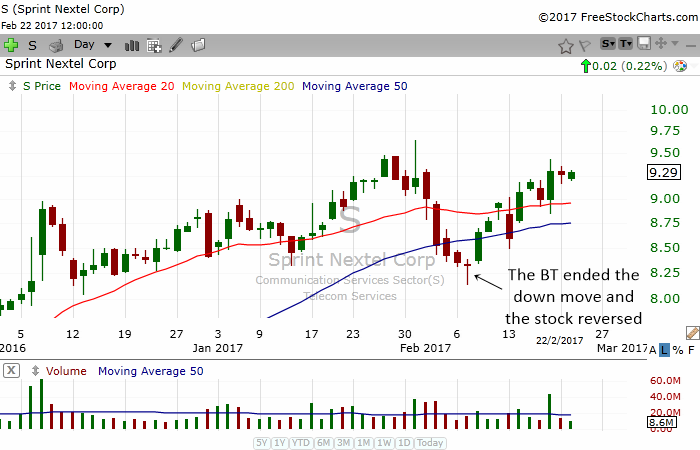 The chart of Sprint above shows another classic example of how a bottoming tail can end a correction. After the bottoming tail appeared, the stock rallied and gave traders a very good trading opportunity. The bottoming tail works very well in longer term charts to show us a major reversal in stocks. 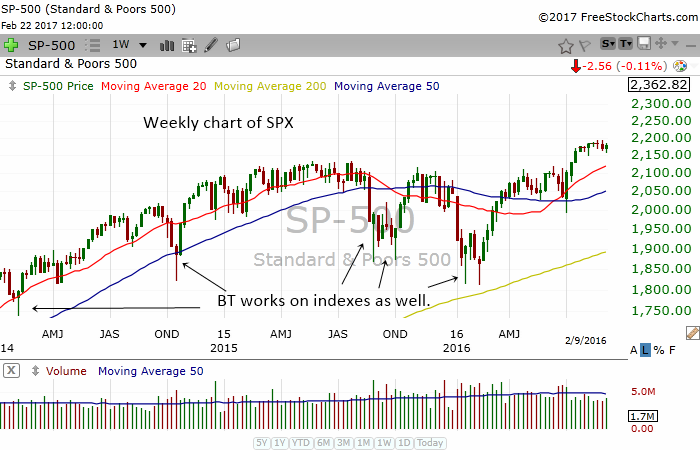 It also works very powerfully in indexes such as the S&P 500. In the chart above, you can see how time and time again the bottoming tail marked a bottom in the S&P 500. When you see a bottoming tail form in the S&P 500 after a bearish move, it gives you a very good signal to buy the market. 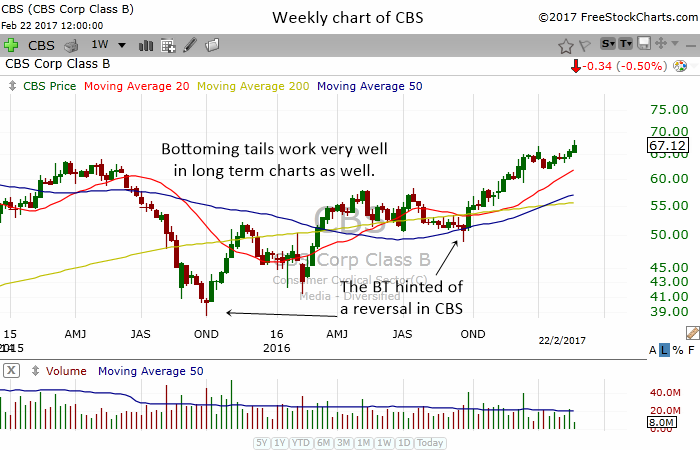 In the chart above, the bottoming tail gave two very good reversal signals in the weekly chart of CBS. Both of them gave us a great opportunity to buy the stock.